My daughter loves experimenting with different flavors and ingredients in the kitchen. She especially loves herbs and spices. This began in preschool when I let her pick a few spices for our home made sweet potato fries and her surprising use of cardamon was a big hit. This month she has been experimenting with popcorn. We call this recipe popcorn croutons because it tastes great on top of salads, tomato soup or a variety of cooked veggies such as chopped spinach marinated with garlic or shredded zucchini. You can also add an herb/spice blend mix for an additional flavor boost. 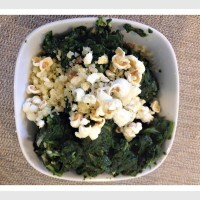 Enjoy popcorn alone or as a veggie, salad or soup topper.